Cyberchase is a relatively new television program on PBS Kids. Since everyone I've talked to has never heard of it or gets it mixed up with some other lame educational cartoon, I'm basing this essay almost completely on my own observations, which could possibly make it very unreliable. Fortunately, my otherwise-would-be-biased opinions have been supported by valuable cutting-edge scientific research based on The Cyberchase web site. This exciting new site is chock full of games, online stories, free stuff, and of course, MATH! Yes, math. Now, we all thought math was too mundane to make a whole TV series centered on it, didn't we? That's exactly why Cyberchase, which happens to be a whole TV series centered on math, must be filled up with all sorts of bad jokes and exciting features. 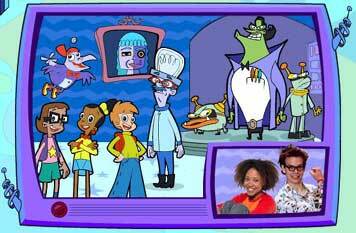 The biggest exciting feature of Cyberchase is its stylish, modern, pseudo-sci-fi atmosphere. The series is set in a place with the ever-original name of "Cyberspace... a place where time and space are one... a place where the lines between reality and imagination no longer exist... a place where anyone can go and anything can happen." Fair enough, I'd say, for managing the countless number of mathematical concepts you can stick in there for enriching elementary school children's interest in the subject. And one can't expect any real profoundness from a kids' show, with maybe one or two shining exceptions. The main attraction of this magical world is that practically everyone is a cyborg or a total machine, and a whole bunch of the characters are cybernetic creations of others. The Hacker was constructed by the scientist Dr. Marbles, and Hacker built his two minions Buzz and Delete, and Digit, a bird-creauture who later betrayed him. It's possible that Digit may have created a smaller bird named Widget whom he keeps as a pet. Disturbing, especially with all this controversy in the ordinary world about cloning and playing God. Cyberspace is controlled by a female figure on a hi-tech computer named Motherboard. She reigns over the world with kindness, peacefulness, thoughtfulness and wisdom, and there's an evil villain called The Hacker who repeatedly attempts to overthrow her. This happens almost every episode, but sometimes he tries to scale down his ambition and just tries to conquer smaller areas like the towns - or "Cybersites" - of Poddleville and Pompadoria, but every time his cunning plans are foiled by the heroes of the series. These heroes, assisted by Digit who affectionately calls them "Earthlies", are three children from our world, which is apparently not a part of Cyberspace. Their names are Matt, Jackie, and Inez, and they are eleven, eleven, and nine years old respectively. Matt is the only boy among them, which is probably meant to make up for the way our culture tries to push girls away from being good at math. Well, goody-good for the creators of Cyberchase, trying to rebel against society. What a bunch of meddling punks. Everyone knows that mathematics are for boys only, and a nine-year-old female child prodigy certainly must be ashamed of herself! One can only seek asylum in the fact that none of the children appear to have entered puberty yet, so there's always the chance Jackie and Inez will lose their interest in helping Motherboard by the time they start sprouting curves and getting crushes on boys. Uh, just ignore their state of never-aging-cartoon-character-ness and you're good to go. The kids are able to enter Cyberspace and travel within it through portals, which are like rippling puddles of some pink glittery solution floating vertically or horizontally in mid-air. Once in Cyberspace, Motherboard informs them of what the problem is and what they have to do, and they use their problem-solving skills to stop Hacker from succeeding in his goals. A major paradox is that the kids are behind on their knowledge of the math that is typically taught in elementary school, yet relatively very advanced in their ability to figure out exactly what they should do and think up quick solutions - well, just in time, usually. But you've got to give them credit for being under pressure! Despite being unrealistic, it's a commendable way to teach math to third-graders, although I wouldn't go as far as to say I wish the show had been around when I was in third grade. The math-teaching part of the show is pretty simple, but the ideas might be ones that elementary school kids find difficult to understand normally, so it's okay. Two or three times there's been an episode about data collection, and one of the last I've watched was just measuring time. They did assume that the viewer was already able to tell time, though, which makes them super advanced. Some other topics covered include exponential growth, fractions, angles, observing objects from three dimensions, and that logic thing where you can disprove a law by finding one example that goes against it. In addition to the animated episodes, which are about 20 minutes long, there's a part called "For Real" which is sort of like "A Word From Us Kids" on Arthur, except that "For Real" is not realistic at all. It consists of short, slightly humorous, acted-out real-life situations involving the mathematical concept the episode was meant to teach. There are two kids, named Harry and Bianca, who take turns being part of these situations. Bianca is a perky black girl with puffy hair, and Harry is a super-trendy kid who wears those thick black nerd glasses you can buy at Hot Topic. Both of them are obviously teenagers, who are perfect for role models, but they refuse to divulge the secret of their real ages, even on the web page. Easily the best part of Cyberchase, however, is its theme song. Seriously! It has a funky beat. It puts the finishing touch on making the program all in all an intellectually and spiritually fortifying experience.